You'll simply adore this antique shoe collection if you like shoes in every style and color. Take a walk in yesteryear wearing the shoes portrayed in this piece. This piece will certainly be a conversation starter. This whimsical design would look beautiful in a bedroom, walk-in closet or a cozy nook. 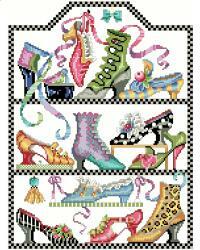 Shoe lovers will love to ‘try on’ this design. Project Size: 10w X 13 3/8h"